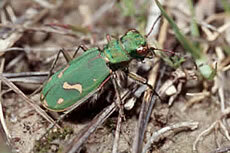 The Ohlone tiger beetle was discovered in 1987 and is found in only five sites in Santa Cruz County, California. Tiger beetles are members of the ground beetle family and often have large bulging eyes, long, slender legs and large curved mandibles (jaws). Adults are bright metallic green in color with leathery forewings and small white spots, and they measure from 9.5 to 12.4 mm long. Their long, slender legs are coppery-green in color. These beetles only emerge for about two months each year (late January to early April). This species prefers to hunt, breed, and dig burrows for their eggs in open grasslands or along open, single-track trails and dirt roads in coast terrace meadows that support native grasses. These trails are naturally created by passing cattle and other wildlife, hikers, and mountain bikers. As its name suggests, the Ohlone tiger beetle is a ferocious predator, preferring to lurk alongside trails to ambush unsuspecting insects and pounce on them along the path. They can also chase prey while in flight. They are active during the day and are able to run or take flight quickly to escape their own predators. Females bury their young (larvae) in moist dirt holes, measuring 4 to 6 mm. The larvae of tiger beetles are usually large-headed, hump-backed grubs that are ferocious predators like their parents, flipping backwards to capture prey insects that happen to cross their paths. Diet consists of ants, isopods, and possibly earthworms. The most serious threats to this species include loss of habitat due to urban development and competition with invasive exotic species. Some non-native plants have taken a heavy toll on native biodiversity. This species is also at great risk of being trampled upon by recreational trail users such as mountain bikers, joggers, and bikers. To preserve their critical habitat and protect the species, each year, the trails are temporarily closed to all users when the beetles emerge in late January. Copyright Notice: This article is licensed under the GNU Free Documentation License. It uses material from the Wikipedia article "Ohlone tiger beetle". Glenn, C. R. 2006. "Earth's Endangered Creatures - Ohlone Tiger Beetle Facts" (Online). 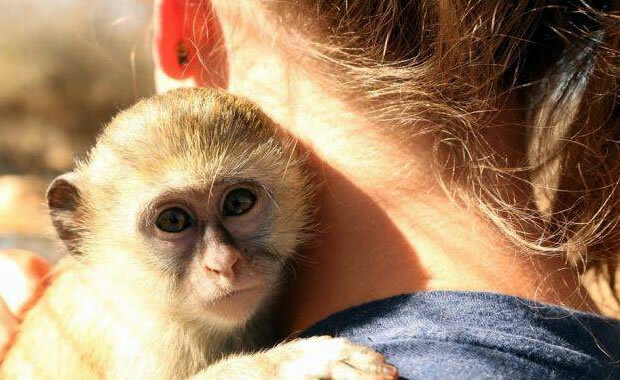 Accessed 4/24/2019 at http://earthsendangered.com/profile.asp?sp=907&ID=9. Need more Ohlone Tiger Beetle facts?